Stephen H. ﻿ Smith produces tables in all forms. Included among these forms are simple tapered legged coffee tables, cabriole legged Queen Anne tea tables, formal and country dining tables, and a host of different side tables and servers. Certainly no table is more significant than your dining table. This is the table where you will share the most joyous occasions of life with family and friends. 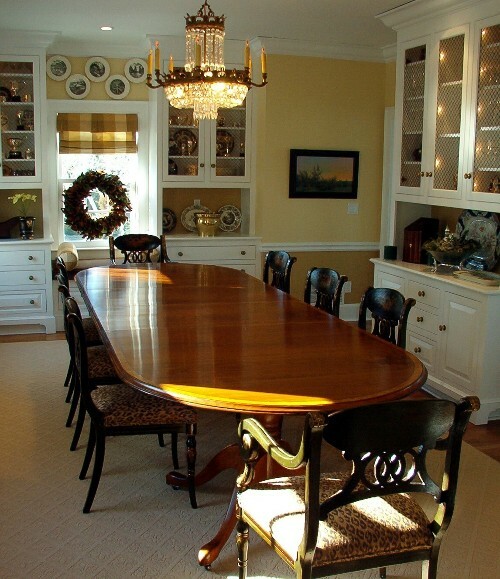 Stephen Smith will work with you to create a dining table that reflects your gracious hospitality, as well as one that compliments the decor of your home. Careful attention will be given to every aspect of your tables’ creation from the selection of the finest materials available to the final hand rubbed finish. Here is a cherry banquet table! It has tiger maple banding with a string inlay of ebony separating it from the cherry. The pedestals have Queen Anne Style legs, and casters to facilitate moving it. A cherry harvest table with a simple tiger maple inlay enhancing the apron. 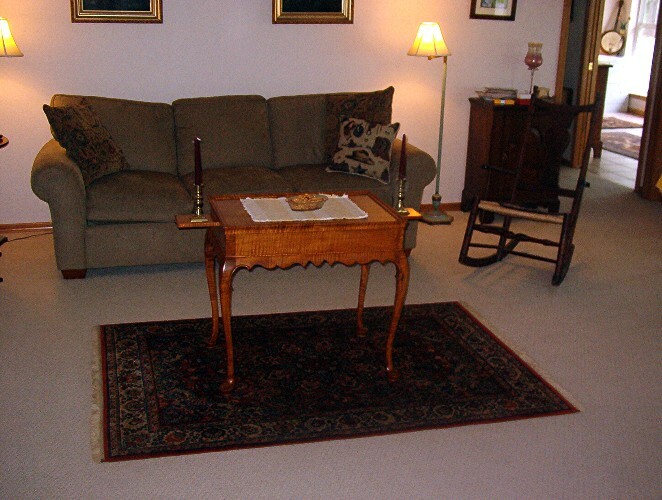 A Queen Anne style tiger maple tea table with candle slides. A cherry farm table approximately 9' long with 2 leaves in place. One pedestal of a walnut banquet table showing how legs are hand dovetailed into base. Two pedestals of a walnut banquet table with fitted brass casters. Walnut Banquet table with tiger maple banding and ebony string inlay. A walnut banquet table with tiger maple banding. This table is a swing leg design with 2 leaves. 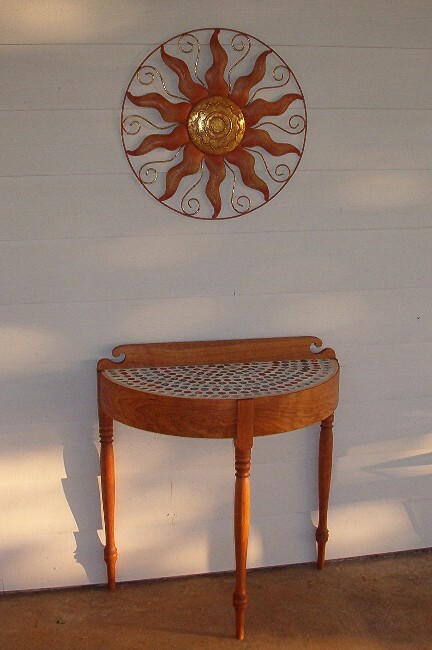 This is a three legged table with a back-splash, and it is about 26" across. The top is made of (beer) bottle caps, set in grout. Just for Fun! The table is made of cherry with an oil finish which darkens in time.